This means that N800 users can now easily position their devices using the vast database of WiFi access points the Plazes network has. And if they stumble on a new one, a web browser window is opened to form where they can enter the network devices to add the new AP to the database. It would be great to get more people to work on this. 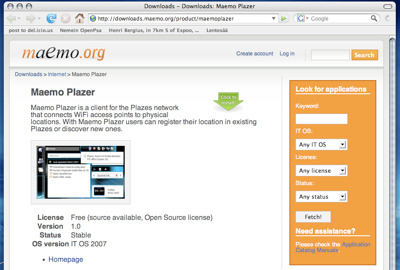 We have opened a Maemo Plazer garage project for it. It is written in Python and uses D-Bus for its communications with the rest of the Maemo environment, so working with it should be fairly easy. Making it act as a GeoClue backend would be a cool step for example. Ferenc has promised to package Maemo Plazer next weekend. Before that, you can grab the sources from SVN and install it manually to your device. 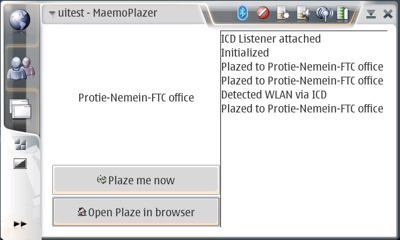 If you place the maemoplazer.desktop file to the /usr/share/applications/hildon/ directory there will even be a clickable icon in the “Extras” folder to start the application with.